Not only calamity and blight, the roots of war and poverty, but also imminent issues like the increasing tendency of social, regional and global fragmentation, or environmental pollution and global warming, cannot be frozen in time. They must be addressed now and we must treat the Earth as if it were one precious life and foster solidarity by truly empathizing with each other. This common wisdom of West and East should be the guideline of our actions with empathy for all forms of life on our Blue Planet, where a speck of dust as well as the endlessly vast universe can both be regarded as ONE. My recurring themes are from Eastern Kegon (Hua-yen) philosophy which has much in common with Western Neo-Platonism including the notion that “All is one and one is all” that the universe is “one living entity” and that there is sympathy (συμπαθεια) within everything (Neo-Platonism). In order to inspire such sympathy between East and West, my intention is to focus —via photo exhibitions, movie screenings and lectures— on select ancient tangible and intangible World Cultural Heritage of Japan, which reflects the legacy of Hellenistic cultural influences in Nara. Showing photographic art work of outstanding National treasures of Japan and Important Cultural Property, that can be traced as far back as 14 centuries ago, as “evidence” to connect the cultural origins of West and East transcending the Silk Roads, our activities are intended to convey the message that we all are one and all is interconnected. 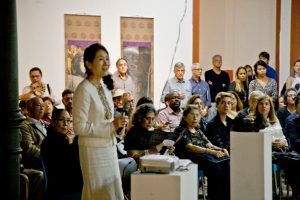 In July, I had the honour of holding a lecture with short movie screenings at the opening event of the “Japan Month” at the venue of my “Road of Light and Hope” exhibition (Cultural Center Correios Rio de Janerio) in commemoration of the 110th anniversary of the Japanese immigration to Brazil. After the event, the former American Consul General expressed her sympathy for my message which she took as an inspiration. Moreover, what I experienced at the Rio de Janeiro State University enhanced my conviction on the importance to point out the ancient cultural interrelations of West and East. In the end, the “Japan Month” in Rio had 62,000 visitors over three and a half weeks. Extensively, Leisurely Observing to the Farthest Horizon. Celebrating Lunar New Year 2018! After 2017 ended as a year where the fragmentation of the humankind became ever more evident, there can be no hope of a brighter future ahead unless people all over the globe, truly become one. Amidst the seemingly never ending conflicts whose seeds lie in prejudice, hate and fear, we can share the aspirations and ideals of contributing to the unity of the world in every possible way, as currently demonstrated by the Olympic ideals we are witnessing in Korea. 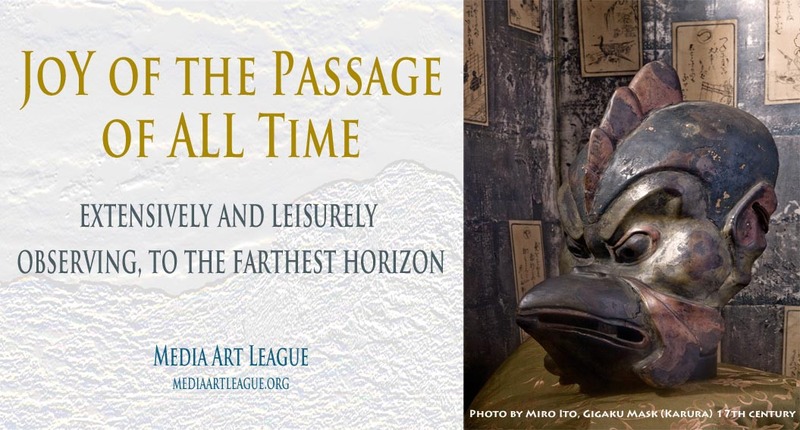 On the occasion of this Lunar New Year, the words of the late Kyōgen Master and fellow artist, Mannojo Nomura V. come to mind: “extensively, leisurely observing to the farthest horizon”. Whether it be on ecological issues or on the various ongoing conflicts around the globe, a sound conscience and consciousness for solutions can be fostered by having a broad perspective that encompasses both past and future. As part of this initiative of mine, I have had opportunities to speak about what I call “the road of wisdom transcending East and West” at the University of Chicago last November. My main theme was the universalism in art form found in the Hellenistic sculptures of the Tōdai-ji Temple from the 8th century, photographs of which were presented in my concurrent exhibition in Chicago. In a religious sense, universalism is the teaching of universal salvation. In its broadest sense, it represents an ideal to affirm and respect each other’s differences based on the universal idea that: all is one. Vestiges of these ideals can be recognized in such performing arts as Gigaku that came to Japan more than 1400 years ago via the Silk Road. The remarkable co-existence of heterogeneous cultures is reflected in their masks as the embodiment of the essence of universalism in the form of art. My globally touring exhibition, “Road of Light and Hope” that launched at UN headquarters in New York in 2016, was subsequently shown at the Academy of Arts of Uzbekistan, the Council of Europe and the Lieu d’Europe in Strasbourg, the Japan Foundation in Toronto, the Japanese Consulate General in Chicago, with the gracious support of co-organizers: the Japanese Ministry of Foreign Affairs and Japan Camera Industry Institute. Gigaku masks were enthusiastically welcomed at various venues and fascinated visitors with their magnificent and vibrant artistic expressions. Incidentally, an inebriated Sogdian King (Suikou), one of the representative Gigaku characters is believed to be modeled after Dionȳsos in Greek mythology. (The Sogdians once inhabited an area that roughly corresponds to today’s Uzbekistan). In fact, Central Asian countries were crossroads of civilization where a panoply of ethnicities and nationalities intermingled. Uzbekistan itself is a veritable “racial melting pot” which is reflected in the facial features of many of its inhabitants today. Since the historic Greek immigration after the eastward incursions of Alexander the Great, a human tapestry of myriad ethnicities co-existed for over 2300 years, allowing the spirit of Gigaku to thrive. 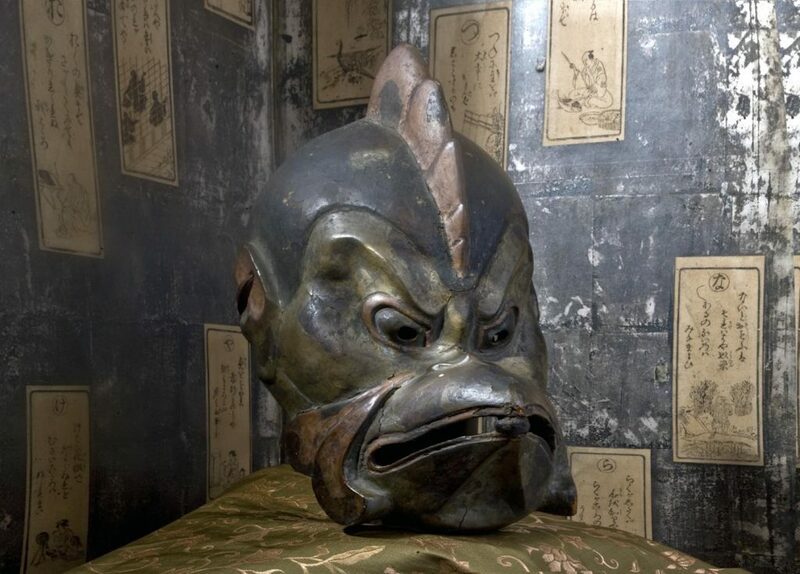 Gigaku —considered to be the oldest form of mask theater on the Eurasian continent— is derived from that of ancient Greece. Although it long fell into disuse as an actual performing art, around 552 AD when Buddhism was first introduced to Japan, Gigaku also arrived. Then Gigaku came to be performed as dedicatory dances for religious rituals at major temples in Japan’s first capital, ancient Nara. 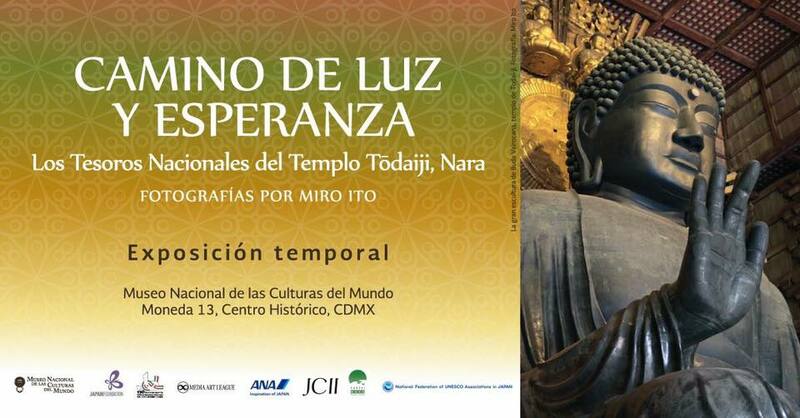 Our globally touring exhibition series, “Road of Light and Hope: National Treasures of Todai-ji Temple, Nara / Photographs by Miro Ito” will start its next VISIT in Chicago 1st November 2017. Commemorating the 120-year history of the Consulate General of Japan in Chicago, this exhibition will run until 28th November presenting 41 photo art works in scroll format, featuring prominent 8th century Tenpyo era sculptural masterpieces owned by the Todai-ji Temple, that are truly rare National Treasures of Japan. Previously an exhibition, “The Great Eastern Temple: Treasures of Japanese Buddhist Art from Todai-ji” was held at the Art Institute of Chicago in 1986. Although 30 years have passed since then, the enduring existence of these 1300-year-old treasures shines a ray of hope to art aficionados even today. In an era where hardships such as natural disasters, famine and blight; kept recurring, similar to the present time, singular events such as the historical one of erecting the Vairocana Buddha 1300 years ago which nearly half of Japan’s able population of 5 million at the time endorsed. Moreover, although the Great Buddha statue was destroyed twice during war, it was miraculously restored in the 12th and 18th centuries, which many Japanese see as a paragon of resilience. Today it constitutes part of the UNESCO World Heritage Site: Historic Monuments of Ancient Nara**. The custom of crafting larger-than-life statues representing the enlightened Gautama Buddha himself originated along the Silk Road in Central Asia. I firmly believe that these imposing giant statues — from the 15 metre-high Great Buddha of Nara to the 30 metre-tall Christ the Redeemer statue in Rio— with their profound religious symbolism exude a sort of power that can unite people’s hearts. Both Buddha and Christ were opposed to their followers creating or worshipping statues of them. Nonetheless, they make us aware that only humanity has the urge to pray. This power of universality found in many works of art is the theme that I would like to address in my prospective lectures at two universities in Chicago, in the context of the coming photo exhibition of National Treasures of Todai-ji Temple. For example at the University of Chicago, I will hold a workshop-style lecture; Visual and Material Perspectives on East Asia, where artists / historians/ aesthetics / creators present their perspectives on respective visual material. I would like to talk about the universality that art can embody and convey —transcending 1300 years of history— to our 21st century world. Namely, I would like to advocate the power of universality in art to foster unity and tolerance that is reflected in the 1300-year cultural heritage from the Silk Road. Essentially, the universality in nature permeates everything as well as the fundamental truth that all humans are created equal despite any differences in appearance or customs. a king of the Sogdian traders along the Oasis Road, Konron, a hermit of the Kunlun Mountains, Karura/ Garuda, man-bird deity, etc. Through this ancient cultural heritage brought from along the Silk Road, we can encounter with a newfound sense of appreciation that comes from universality, transcending time and space, feeling that “every one of us is an indispensable flower”. Embodying one of the most important core philosophies of Hua-yen (Kegon) Buddhism, this is why the Great Vairocana Buddha was erected by Emperor Shomu in 752 AD. As for Chicago, this city is the center of modernism in the fields of architecture, design and photography in the USA. For example, Lazlo Moholy=Nagy, a photographer, typographer, painter, and educator came to Chicago, after leaving the legendary Bauhaus, the German national school of art closed down by the Nazis in 1933. There he founded the New Bauhaus (later integrated into the Illinois Institute of Technology [IIT]). Its leading modern architect, Mies van der Rohe became Director of the School of Architecture at Chicago’s Armour Institute (later IIT) in 1937. The Bauhaus in its own right embraced the spirit that art changes society, born of the Central-European revolutionary socialist movements forming in Germany, Hungary and Czechoslovakia in 1920’s. In the field of photography, Construction, Movement and Light were the dominant themes in its bold formative and visual experiments. In architecture, the Bauhaus aimed to establish a rational functionalist style, having pronounced similarities with the Sukiya-zukuri or Shoin-zukuri of Japanese architectural styles of Samurai residences during the medieval to early modern eras. Bauhaus-dominated modernist architecture thus has many elements in common with Japanese traditional architecture. As for the assertion that art changes the world central to the 1920’s movement of modernism, if art can change the world, I believe that very key for such change should be the message of “universality”. Incidentally, the concept of “universal space” was first proposed by one of the three great modern architects, Mies van der Rohe, whereby a wide variety of functions can be allocated in a large long-span single space. Similarly, in today’s architecture and design sectors, the concept of “universal design” applies to accessibility for everyone, regardless of age or ability. In a similar sense, the universality of mind & heart must apply to everyone. For this to be achieved, we must respect and accept everyone’s inherent differences, and consciously strive for solidarity rather than segregation, tolerance rather than discrimination, compassion rather than hate. Coming back to the National Treasures of the Todai-ji Temple, although the Great Buddha statue was destroyed twice, it could be reconstructed both times only because the statue and the task of its reconstruction made people adhere to the above principles, dedicating their hearts & minds to perform a miracle that only universality can foster. Of course, this is but one example from my own culture. There are numerous statues, monuments and buildings around the world that could only be saved or restored due to people’s power of prayer for peace. Besides sending this message, this appeal for solidarity, compassion and understanding, we at Media Art League are going to hold a special opening event on the night of 1st Nov. (18:00 -19:00) at JIC Hall, Consulate-General Chicago. We are going to show two short movies that we produced, accompanied by an exceptionally rare Gigaku + Ballet performance by fellow artist, ballet dancer/performer, Shunso. Gigaku is the enigmatic mask theater with a 1400 year-old tradition that can be traced back to ancient Greek mask theatre, which had once been lost but survived with 14 character masks only in Japan; at major temples in Nara such as the Todai-ji and Horyuji. We are revisiting it as a Ballet mini performance, seeking to connect our common cultural origins in East and West. The core message being: we all are one. Should you have any chance to come to Chicago from 1st to 28th of November, please visit my touring exhibition in Chicago. We would like to welcome you from the bottom of our hearts. 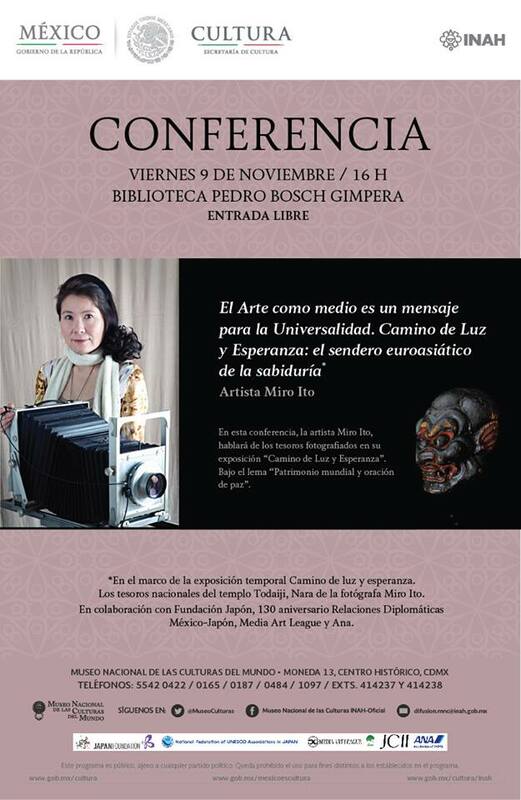 Please click here to download the exhibition flyer. 16 years have now passed since the events of 9/11. 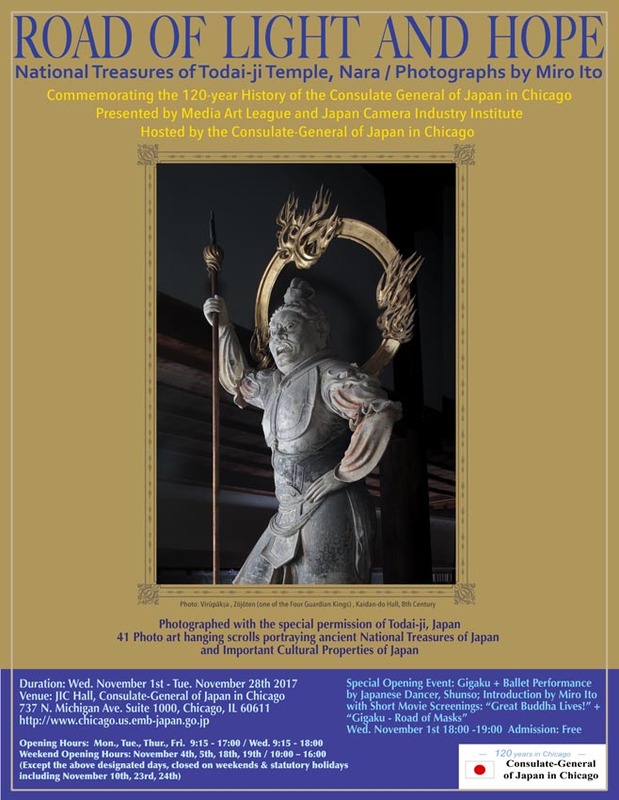 With the special assistance of the Todai-ji Temple, and co-organized by the Japan Foundation Toronto, Media Art League and Japan Camera Industry Institute (as well as Japan’s Consulate-General in Chicago [from 1st Nov. 2017]), this exhibition attempts to share the universality of the ancient teaching that we ourselves are the universe. Although, the scale of the universe is beyond our imagination, once we realize that our bodies are unto themselves a microcosm containing a universe in each of their tiny constituent cells, the universe’s interconnectedness becomes more tangible. Through this awareness we might end up with an alternative option: to consider the living universe (including Mother Earth that supports all life activities) as synonymous with our own “life”, and respect it and live in harmony. Or to continue to essentially see this green planet as a “resource” to exploit, pollute and ultimately devastate. Needless to say, destruction will in turn only bring disharmony to our earth and interrupt the circle of life. Rightfully, one is all and all is one, a holistic notion is postulated in the Neoplatonic philosophy of ancient Greece. In the common way, the teachings of Kegon-kyo (Japan’s iteration of Hua-yen Buddhism), that form the spiritual foundation of the Great Buddha Statue being erected in Nara in the 8th century, tells us that an infinite universe of galactic proportions is contained in an infinitesimal one. Once we realize of that everything is interconnected and cyclical within life’s flow of the universe, the awareness of such issues as environmental preservation and climate change grows, in addition to overcome segmentation on the global level. On the occasion of the Artist’s Talk, 26th May, the auditorium of the Japan Foundation Toronto was filled and three movie shorts of mine were shown, such as “The Great Buddha Lives!”, “Life of Masks, as well as “Gigaku: Road of Masks”. With the people present on this occasion, I could share the message that we can learn from the spiritual heritage from the Silk Road transcending 1300 years of time and space; all is one, and all is interconnected. Hopefully, visitors will attain a new awareness for the common origins of sculpting as seen in Japanese National Treasures of 1300 years ago and in Hellenistic art in the eastern Mediterranean and Mid-Eastern world around 2000 years ago. While expressing my heartfelt gratitude for all supporting entities as well as visitors to this touring exhibition series, starting from the UN Headquarters in NY, via Academy of Arts of Uzbekistan, the Council of the Europe (and the Lieu d’Europe), and for its new success in Toronto and then goes to Chicago, I truly hope we can work together towards the idea of a unified world, to which my art activities have been dedicated for the last 16 years since the 9/11 that I experienced in NY. Hopefully, a time of unity will finally come after so much turmoil in the universe and amongst humankind: between humankind and nature, between human and human …. The official press release for the next exhibition in Chicago will follow shortly. 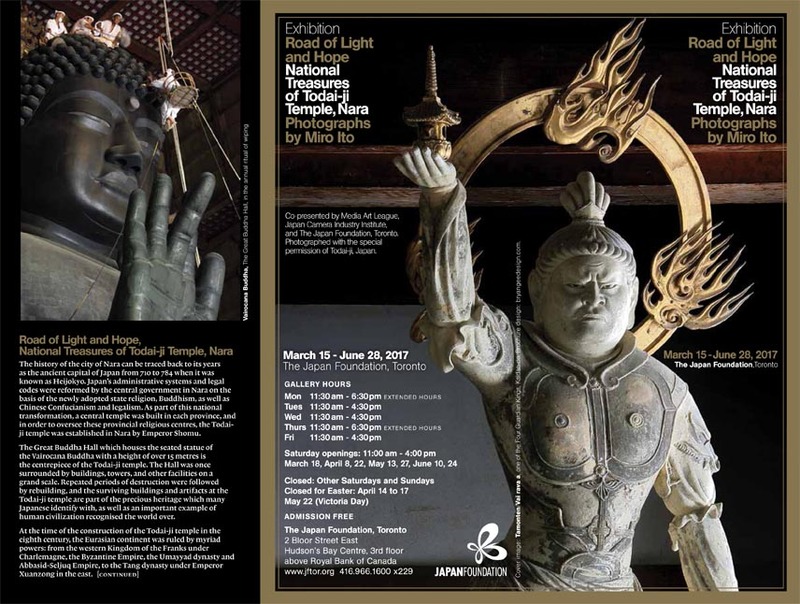 Media = Art + Message #2 – Todai-ji Temple’s treasures as evidence of ancient cultural cross-pollination in Nara: Toronto photo exhibition starts. The photo exhibition “Road of Light and Hope: National Treasures of Todai-ji Temple, Nara” opened 15th March at the Japan Foundation Toronto where it will be on display until 28th June 2017. This exhibition collects representative photographic images of artifacts of the Todai-ji —collected throughout its eventful 1300 year history— especially those that are evidence of cultural cross-pollination between east and west. One is against the background of the construction of the Todai-ji’s Great Buddha (Vairocana) that symbolizes all the interconnectedness. The other is the cosmopolitanism of the Tenpyo era (729-749) sculptures with their traces of Hellenistic influences —conveyed to Japan via the Silk Road— evident in their features. With the special permission and cooperation of Todai-ji Temple, and the kind offices of Japan Camera Industry Institute (JCII), Media Art League and the Japan Foundation Toronto are co-presenting this exhibition, comprising 41 photographic hanging scrolls of national treasures and important cultural assets, and 30 framed photographs. Since 2004, I have been photographically documenting these cultural testaments seeking to build bridges between east and west, adopting the ideals that I have learned from the history of the Todai-ji and its founder, Emperor Shomu. About thirteen centuries ago during the Nara era, the great Vairocana Buddha statue of Todaiji Temple was erected at a time that frequently saw unprecedented natural disasters like huge earthquakes, droughts, famines and epidemics. Some 4.5 million citizens came together to help fund this undertaking. Under the slogan, “every single blade of straw or handful of soil helps”, Emperor Shomu called for everyone from all corners of the land to contribute to the best of their ability. Tens of thousands of people provided their labour enabling the huge statue to be completed in the year 752. The project provided encouragement, stability and employment to the people at a time when they were disheartened and burdened by repeated heavy disasters. From its completion to modern times, the giant Buddha statue faced numerous earthquakes and wars during which it was twice destroyed. Each time, the citizens performed miraculous reconstruction work. Consequently, the giant Buddha has become a powerful symbol of Japan’s hope and resilience. Concurrently, it is also a symbol of solidarity and interdependence in keeping with the Hua-yen Buddhist tenet that governs the universe: “all is one and one is all”. In fact, while the traditions embraced by the Todai-ji are considered by many to be the quintessence of the Japanese psyche, I am endeavouring to share and convey these, through my photographs, across borders and cultures. Now, in March 2017, it has been six years since Japan’s triple disaster (earthquake, tsunami, and nuclear reactor catastrophe), yet ever more mega-disasters as well as regional conflicts and religious strife appear to be threatening the world order. Against this background, it is ever more important for us to seek to restore a semblance of peace by genuinely attempting to empathize and share with the growing multitudes of disadvantaged and vulnerable people around the globe. It is thus a great honour and pleasure for me to send my humble appeal for solidarity among all living beings to the people of Canada, in the spirit of the emperor Shomu, who prayed that all flora and fauna would prosper with the completion of Japan’s first great Buddha statue. The world traveling exhibition “Road of Light and Hope: The Eurasian Trail of Wisdom (Σοφια) — between East and West—“ began at the United Nations HQ in New York last May, and was followed up by exhibitions at the Academy of Arts of Uzbekistan in Tashkent and at the Council of Europe HQ as well as le Lieu d’ Europe in Strasbourg in 2016 has now reached Canada, where it will be presented in Toronto at the gallery of the Japan Foundation (albeit, with a different sub-title: “National Treasures of Todai-ji Temple, Nara”) from 15th March to 28th June. On the 26th of May, I will go to Toronto to hold a lecture accompanied by a screening of short movies on the topic. 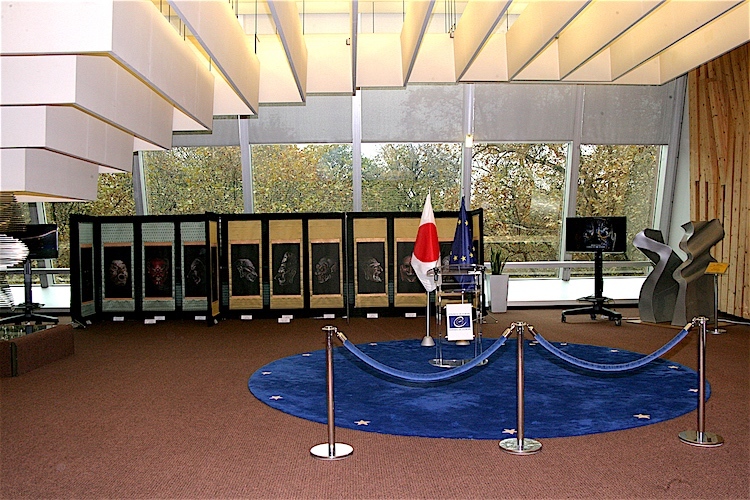 On the morning of 9th November 2016, when the outcome of the 2016 U.S. election could no longer be denied, I was in Strasbourg where I had the honour of holding my touring exhibition “Road of Light and Hope” in commemoration of the 20th anniversary of Japan’s attaining Observer Status at the Council of Europe (CoE), one of the leading organizations for human rights, democracy and rule of law*. At the ceremony, current Consul-General Shinsuke Shimizu (Japan’s “Observer-Envoy” to the CoE) as well as CoE General Secretary Thorbjørn Jagland acknowledged Japan’s commitment as an Observer over the last 2 decades. Looking back almost half a century to 1938 on that same day brings us to the ignominious Kristalnacht (Night of Broken Glass) in Germany, a nightmare that was a harbinger for far worse still to come. This pogrom sanctioned by the Nazi regime left 276 synagogues and approximately 7500 Jewish-owned business establishments/properties destroyed in the Third Reich. Almost 30,000 German Jews were arrested and sent to concentration camps, most of whom were later released contingent on their willingness to emigrate to other countries. Unity and solidarity have never seemed more important than now. After being exhibited at the Council of Europe, my exhibition “Road of Light and Hope” moved to an exhibition pavilion at Lieu d’ Europe (also in Strasbourg) from 19th November to 16th December. Strasbourg (or Strassburg) is ideally suited as a venue, because this once German city, which changed hands numerous times over the centuries —although nominally French— now is a melting pot of Franco-German culture located directly on today’s border between the two former arch-enemies; in fact, it is a symbol of the friendship and close ties enjoyed between contemporary France and Germany. Both countries have sworn to not allow this city to become a bone of territorial contention ever again and it will hopefully remain as an enduring symbol of solidarity for the entire world. *The Council of Europe is one of the leading international organizations advocating regulations & standards for the international community pertaining to human rights, democracy, rule of law, etc. ; a total of 47 countries —including Russia— are currently members. This exhibition of photographs of Japanese National Treasures, entitled “Road of Light and Hope”, is being held on the occasion of the United Nations Day of Vesak, an annual celebration of Buddha’s birth which falls on the 20th of May in 2016. 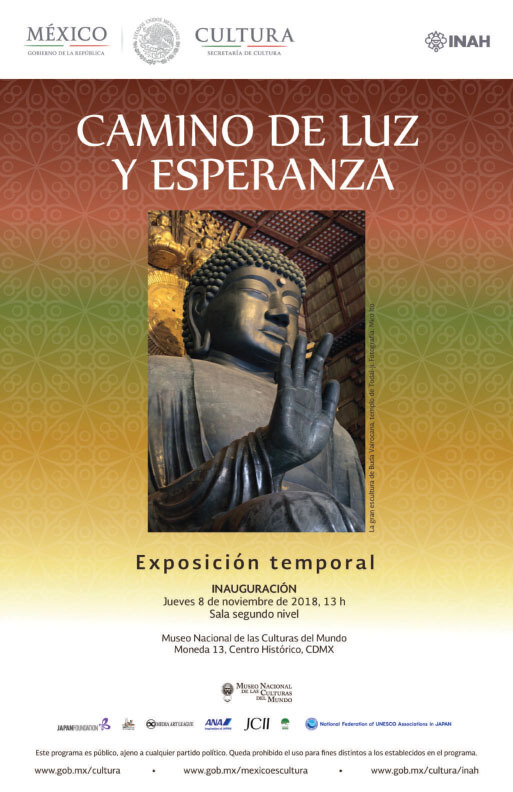 The exhibited photos portray the most prominent National Treasures of the Tôdai-ji Temple, where the Great Vairocana Buddha was erected by Shômu Tennô (701-756), which today constitutes part of the UNESCO World Heritage Site: Historic Monuments of Ancient Nara / Heijô-kyô (Japan’s Imperial capital from 710 to 784). The origin of Buddhist statues can be traced back to ancient times when images of Buddha with Greek-like features appeared in the Indian cultural sphere (primarily the Gandhara region of today’s Pakistan) around the 1st century BC. These figures’ external appearance was influenced by Hellenistic culture which appeared after Alexander the Great’s expeditions into Asia (334-324BC). Statuesque human-like figures of Buddha originating from ancient Greece spread from Gandhara or Mathura (in today’s India) all the way to East Asia via Central Asia together with such religious sites and monu- ments as cave temples and stupas. 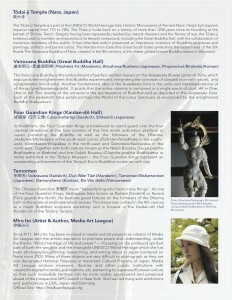 The origin of the Vairocana Buddha (**) of the Tôdai-ji Temple being shown in this exhibition can be traced back to such practices. Concurrently, the Great Vairocana Buddha Statue visualizes the teachings of Hua-yen / Kegon Buddhism: vistas of a boundless universe are engraved on each of its pedestal’s giant lotus petals. The statue embodies the tenet “All is One and One is All” where infinity can be contained in the Infinitesimal, and the maximum can be reduced into the infinitestimal, akin to neo-platonist philosophy (3rd-6th century) in ancient Greece. Moreover, the Vairocana Buddha seated in the lotus position of enlightenment symbolizes the interdependence as well as interconnectedness of life and the universe. Also known as the easternmost end of the Silk Roads, Heijô-kyô (today’s Nara) was a capital along the lines of Chang’an (the Imperial capital of Tang Dynasty China) with a flourishing cosmopolitan culture accentuated by various cultural relics from the Eurasian continent. Nara preserves many examples of cultural heritage that have been lost in other countries. Particularly the numerous treasures of the Shôsôin Repository (*) of the Tôdai-ji-Temple show the very essence and variety of sophisticated Eurasian culture 1300 years ago. In the Tôdai-ji Temple, around the same time when the Great Buddha Statue was erected in 752, masterpieces of Tenpyô Era sculpture with their lifelike features brimming with vitality and wisdom were created in the major Buddhist sculpture workshop. (*) Jurisdiction of the Shosoin now lies with Japan’s Imperial Household Agency. Upon examining these Tenpyô Era sculptures, a similarity with ones from the Italian Renaissance (14th to 16th century) in which a revival of Platonism provided a philosophical basis for the arts and cultural activities in general to set free its humanity — accompanied by a respect for individuality in line with classic Greco-Roman culture. In Tenpyô Buddhist sculpture, regarding any of their realistic ―yet idealistic― physiques and lifelike expressions, their roots in ancient Greek culture become evident. 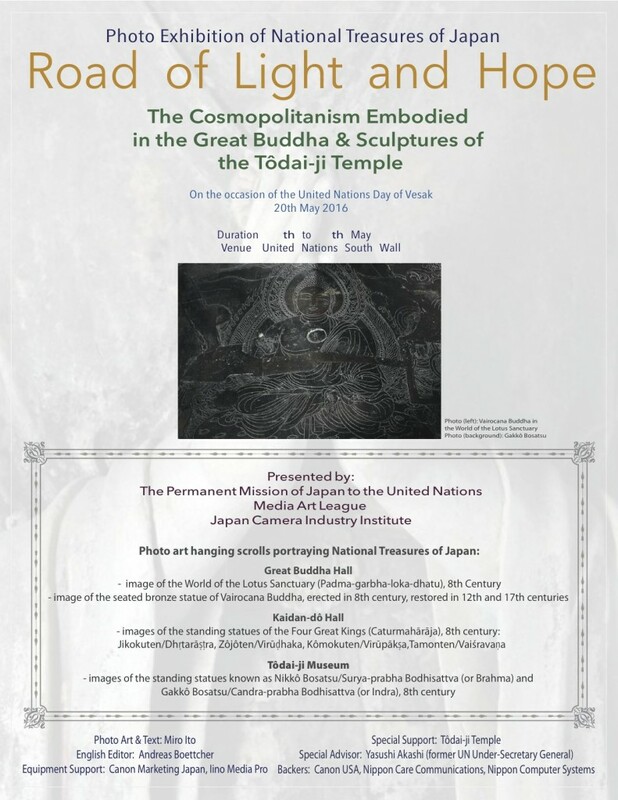 With the special cooperation of the Tôdai-ji Temple, this photo exhibition introduces the Statues of the Four Guardian Kings (Caturmahārāja) in the Kaidan-dô Hall (Kaidan-in) ‒ together with the pair of statues known as the Nikkô Bosatsu (Surya-prabha Bodhisattva or Brahma) and the Gakkô Bosatsu (Chandra-prabha Bodhisattva or indra) exhibited in the Tôdaiji Museum ‒ which represent the most outstanding achievement of Tenpyô Era Buddhist sculpture with clay. These figures of cosmopolitanism are evidence of ancient interchanges between East and West, along the Silk roads. As expressions of light and enlightenment can be reached by disciplining one’s mind and body, they are found in much of the cultural heritage around the globe, transcending differences of time and culture. By exploring ancient cultural heritages along the “Road of Light and Hope” connecting the western and eastern reaches of the Silk Roads, this exhibition casts a light of hope for global solidarity and therefore, towards true cosmopolitanism. Exhibits of photo art works in traditional hanging scroll style are being created by Miro Ito who, after experiencing 9/11 in New York firsthand, has been pursuing themes of the World Cultural Heritage and National Treasure in Nara, aspiring to serve as a bridge of the heart and mind between East and West. Starting from the United Nations Headquarters in New York, this photo presentation will be shown around the globe by co-organizers, Media Art League and Japan Camera Industry Institute, in Tashkent (Tashkent International Biennale of Contemporary Art), Strasbourg (exhibition at the Council of the Europe organized by the Ministry of Foreign Affairs of Japan), Athens, Tokyo, etc.